As I drink my coffee from my lovely new mug, I was recently at a conference on Orca’s Island, this is one of the prettiest places I have been in a very long time. It’s in the San Juan Islands, about a 2 hour ferry ride from Victoria, British Columbia, Canada. One of the things I like to do when I am in a new area, is to take some time to explore. It’s a relatively small island, so I rented a little moped to explore the different places. I stopped at Olga Pottery www.olgapottery.com, it is owned by Jerry Weatherman. His work is really beautiful, unique & practical. I asked him a question “Does your work bring you joy?”. “It gives me deep satisfaction, I am continually growing and discovering new things, even after 43 years, and I have a short walk to my office”. I look at relationships, a lot like work, if you were in a relationship for 43 years & were able to answer in the way Gerry did, most people would say that you have chosen a great partner. His response was for me a textbook definition of joy. He has what most of us are looking to find in work & in our life. 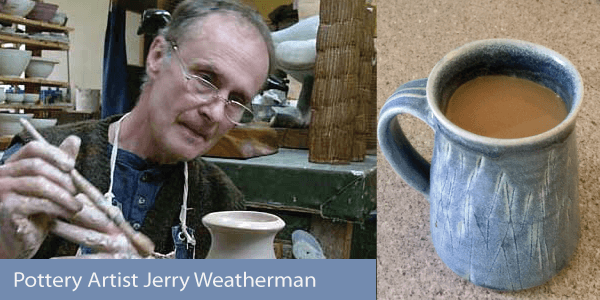 As a potter he starts with the raw material & sculps with his hands something of beauty & value. To me, this is the opportunity we all have in life. Our raw materials our are talents, passions, intelligence, personality & values. Like the potter we can sit at the wheel of our life & work at producing something that we are proud of. That is both our opportunity & responsibility in this life. Jerry & Chris are for me two excellent examples of sculpting their careers & lives into a life worth living. CareerJoy works: Read our success stories. P.S. Looking to identify the right career for you? The Career Identity Program is a 1-1 customizable program to help identify & narrow down practical answers to that complex question. P.P.S. FREE CareerClass this Wednesday, August 5, 2015 from 12:00 pm – 1:00 pm EST. Social Media & Your 3D Personal Brand. Sign-up here!